The needs of larger-sized HMI have grown for pursuing easy-to-understand machine operation to increase productivity, monitoring multiple processes in block because of labor reduction, and displaying information to assist technology/skill transfer. 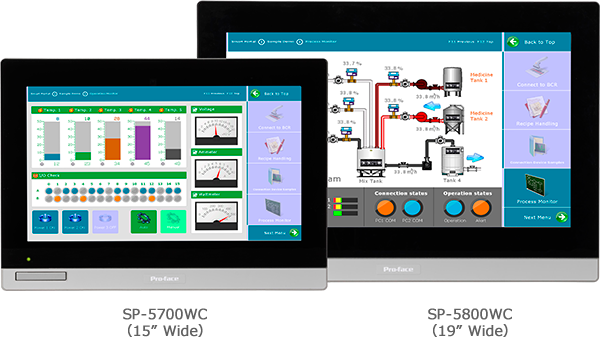 Machine manufacturers wish to add a value to machines by mounting such a high-quality HMI. The large-sized HMI with high display quality and visibility which satisfies the manufacturers' needs has just joined in the SP5000 Series. The SP5000 Series' modular design that allows the display to be attached to and detached from the box has earned popularity. For the display module of the SP5000 Series, there are two types, 19" wide and 15" wide, available now. The size is at the level of the largest size in this field as HMI with a real-time operating system. You can select the most appropriate size in a wide range of products from 19" to 7" wide (formerly up to 15") for the SP5000 Series. The contemporary appearance and the high-quality display with glass face lend the whole machine a premium feel and the reinforced glass provides scratch resistance as an important benefit. It's possible to configure a reliable HMI system as an on-site terminal for line management and process automation. Reinforced glass display surface offers high quality and strength.